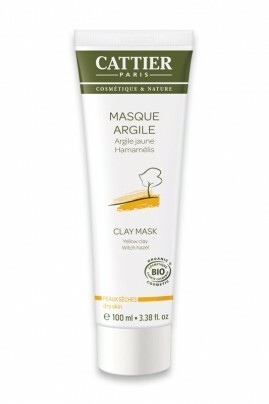 Soothing and re-mineralising, Cattier Organic Yellow Clay Facial Mask nourishes and softens dry skin. Its perfect blend of Yellow and White Clays is a gentle, toning treatment for dry and fragile skins. Enriched with Jojoba oil to moisturize and protect, with Peppermint for its refreshing, antiseptic and stimulating properties, and with essential oil of Geranium, it softens, soothes and nourishes the epidermis at the same time as detoxifying and clarifying the skin. Due to the high content of micro-nutrients present in the clay, Cattier Organic Yellow Clay Facial Mask provides the minerals and oligo-elements needed for a healthy, glowing complexion. Shake well then apply Cattier Organic Yellow Clay Facial Mask in a thick layer over the face and neck, avoiding the eye and lip areas. Leave on for approximately 10 minutes without letting the mask dry on the skin. If needed, spray on some Cattier Organic Soothing Toner "Rosée Florale" to moisten the mask. Rinse off with tepid water and dry the skin with a cotton towel. Complete the treatment by applying Cattier Organic Nourrishing Cream "Secret Botanique".